Do you believe all computer recycling companies are alike? That all of them essentially do the same thing in the same way, so that it doesn’t really matter who you do business with? You’d be wrong. In fact, it really pays to make sure the recycling company you are dealing with is honest and reputable. You’d be surprised what some so-called recycling companies are up to. You’re entrusting the computer recycling company with the safety and security of your data. Ensuring that your data doesn’t end up in the wrong hands is one of the MOST important reasons why you should recycle electronics rather than simply throwing them away. Yet some unscrupulous companies actually aid and abet criminals instead. How? Your hard drive ends up in the hands of criminals. Then, they pull the data off the hard drives for their own unscrupulous purposes. This exposes you to identity theft. It is also an incredibly egregious breach of trust. Remember, you’re not handing these companies “old junk.” You’re handing them personal, private, and sensitive information that needs to be destroyed. Note that reselling is not the problem here. Some recycling companies do sell some of the items they receive once they’ve been properly cleared and wiped. The issue is whether or not the data was wiped at all. Making sure you work with a fully certified e-waste recycling company with all the proper certifications is a must. If you care about the environment, you want to make sure your electronics are being handled responsibly. Many of our clients come to us because they really do care about being good environmental stewards. They know that computers are filled with some very toxic components, and they don’t want to see those toxic chemicals leaching into our soil and groundwater. We feel exactly the same way. That is why we do everything in accordance with EPA guidelines and why we’ve sought some of the industry’s most rigorous certifications. We care about the same things our clients care about. However, there are “recycling” companies out there who are just out to make a fast buck. They take your electronics and then just send them on to landfills around the world. We don’t know what is going through the heads of someone who makes the decision to do something like this. Perhaps they feel like their job is really just to get your old junk out of sight and out of mind. We feel like our job is to help our customers keep computers out of landfills, and we don’t care whether the landfill is in Houston or in Hong Kong. We hold to our strict no-landfills policy. Our detailed inventory reports tell you precisely where your electronics are at any point in the data destruction or recycling process. This means you know what’s happening from the moment you give us custody of your device until the moment the recycling process is complete. One big red flag you should be looking for is whether or not there is any charge to recycle your electronics. Often, people feel like it should be free to recycle these electronics and so are taken in when scammers come to call. But it costs money to recycle, just like it costs money to do anything else. And recycling electronics isn’t the same as recycling cans and bottles, which have just a single component. Soda cans may easily be smelted back down into aluminum. A computer has dozens of different raw materials which must be separated out and accounted for. Customers can send us a list of the items to be recycled and within 48 hours we will have evaluation back to you to offer a service, charge for the pick up or you could be paid for your items. 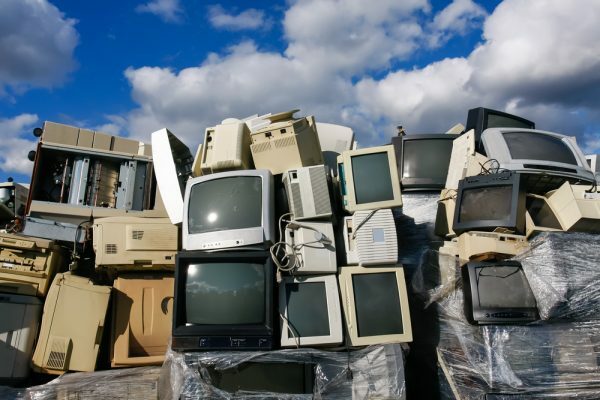 Recycling companies who take your electronics for free are making their money somewhere. Think about it. Our quote is competitive with responsible recycling standards. What else should you look for in a computer recycling company? First, you should look for certifications. You need to know that the recycling center has undergone some rigorous third-party inspections before you trust them with your electronics. Second, you need to think about the people who are operating the company. Meet with some of them if you can. You are literally handing them your organization’s most sensitive data. You may even be handing them some of most sensitive personal data too. Doesn’t it make sense to be absolutely certain that these are people you trust to do the right thing? Third, you can check recycling company reviews on third party sites just like you can for any other service you can name. Look at Angie’s List, Google+ and other places to determine whether or not the recycling company is known for doing the right thing. Finally, Google the name of the company itself. Find out if they’ve been involved in any lawsuits, investigative reports, or scandals. If you don’t like what you see, find someone else to work with. At RAKI Electronics and Recycling, we have nothing to hide. we’re more than happy to take you on a tour of our 20,000 square foot facility and to show you how it all works. We are family owned and operated, so you’ll get to meet the people who will be directly involved in the recycling process. We’re happy to answer all of your questions and concerns, and we’re happy to show you what we’re going to do to make your life easier while exercising outstanding environmental stewardship. Contact us today. We can’t wait to meet you.